The San Miguel drop-in bathroom talavera Mexican sink should be the focal point of your next bathroom or remodeling project. This bath sink was created by skillful master artisans, therefore accomplishing a beautiful functional work of art. 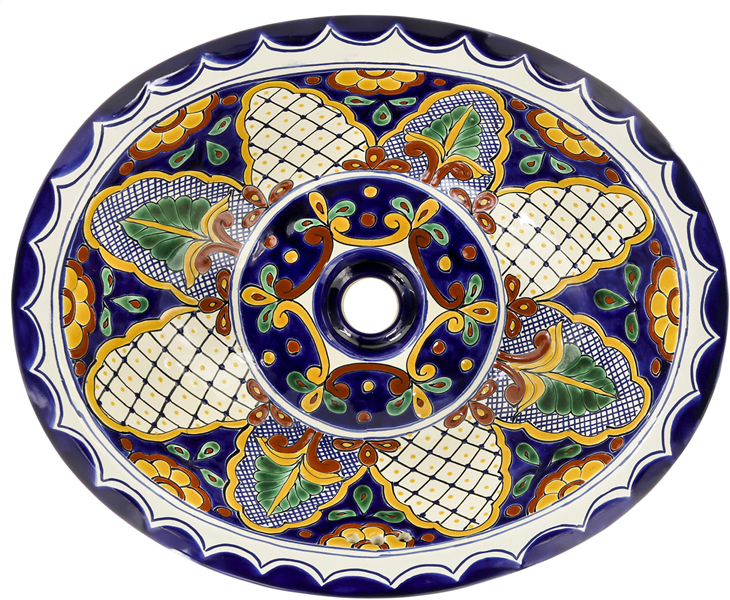 Our collection of ceramic sinks is hand painted by utilizing the Talavera painting technique, which results is an impressive designed sink. We ship directly from our San Diego, California warehouse. MexicanTiles.com's collection of bathroom Mexican sinks is handcrafted and hand painted, therefore each sink is a unique functional piece. 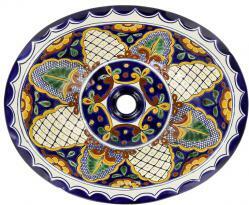 As with any handcrafted item, our Mexican ceramic sinks will have small variations in color, design, size, and weight. These bathroom sinks are made using the best materials in the industry. We have a large selection to choose with a wide range of designs and themes. Our bathroom ceramic sinks set apart from the standard with detailed designs and rich colors. They can be used in just about any setting, and are ideal to be the focal point of any bathroom. * Free Ground Shipping: In order to receive FREE UPS Ground Shipping on this sink, anywhere in the lower 48 US states, please use Coupon Code: SHIPFREE at checkout. Appropriate shipping charges apply to all shipments to Alaska, Hawaii, and U.S. territories. All other services will incur regular shipping costs, as quoted by UPS. Not valid on previous purchases, exchanges, or special orders. If customer returns any items from an order that received FREE GROUND SHIPPING, the original shipping savings associated with the returned item(s) will be deducted from the refund amount. We reserve the right to change or discontinue this free shipping offer at any time. Order Online 24/7. Or call during normal business hours to place your order. Ships within 2 business days from San Diego, California. Finish: Hand Painted Talavera. All our sinks have an off-white background. How to Care: Nonabrasive cleaner. Mira Clean #1 is recommended. Since no template is provided with this sink, set the bowl upside down on the countertop and trace the outline, then draw a second line about 3/4 inch inside that line to serve as your cut line. Place a bead of plumber's putty around the bottom edge of the drain-assembly housing's lip, then press the housing into the drain hole. Attach the gasket and washer, then tighten the locknut. Be careful not to apply to much pressure because the drain hole may break. Remove any excess plumber's putty. Attach the tailpiece to the housing with the slip nut and washer. If you haven't already done so, install the faucet. When the faucet is in place, turn the sink upside down and run a bead of silicone adhesive along the underside of the molded lip. Turn the sink over and carefully align it with the countertop's front edge. Press firmly around the lip to form a tight seal. After the adhesive has set, apply a bead of latex caulk around the edge, then smooth it with a wet finger. These tips are meant as a helpful resource. MexicanTiles.com strongly suggests consulting a licensed contractor.